If you had invested in unit trust or mutual funds, I am sure that you had heard of Dollar-Cost Averaging (DCA). Another strategy not commonly used in unit trust investment is Value-Cost Averaging (VCA). For long elaborated explanation, you can refer Rajen Devadason’s article here. VCA is more advanced than DCA. It requires more calculation and monitoring. Thus, it should provides better return than the normal DCA strategy. It is easier to be implemented in direct stock investment. Let’s take iCapital closed-end fund as an example. In October 2006, you bought RM10,000 of ICAP price RM1.30, total unit is 7692.30 unit. In real case, you will have to buy 7700 unit. In October 2007, your targeted value of your ICAP holding is RM20,000. But now the price is RM2.18. Your existing investment value is 7692.30 x RM2.18 = RM16769.23. Since your targeted investment value in ICAP is RM20,000, still short of RM3230.77. The number of unit you need to top up now is RM3230.77/RM2.18 = 1482 unit. In real case, you will have to buy 1500 unit. 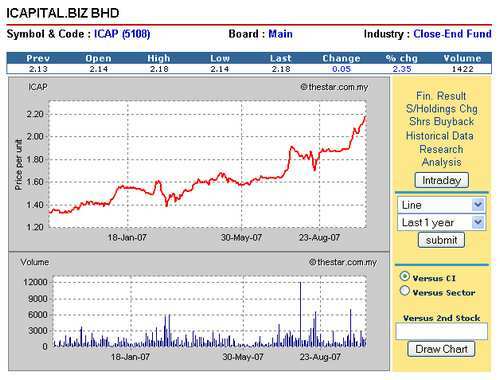 In October 2008, let’s say ICAP falls to RM1.50. Your targeted value at that time is RM30,000. Your investment value at that time will be RM1.50 x (1482 + 7692.30) = RM13761.45. So you will have to invest additional RM30k – RM13761.45 = RM16238.55. The additional unit will be RM16238.55/RM1.50 = 10825.70. Average unit cost = RM29469.32/20,000 = RM1.47. This concludes that VCA is better than DCA because you will get a lower cost per unit of share. when the value of the investment keeps dropping, you will need to fork out more money to invest. Don’t go over the roof and bankrupt when the value drop to zero. But sometimes, there are no resources left to invest to make up the targeted value. For the case study above, in October 2008, the investor might not have RM16k to invest. when the value goes up, you just invest less and less. You will have to find other investment to park your additional money that is not invested. I think the best way is to keep to your fixed portfolio. No matter how much you can afford to invest at any particular time, just always stick to the same asset allocation as predetermined. Unless your investment objective had changed. 4 replies to "What is Value-Cost Averaging?" Thanks for sharing with your children about this.